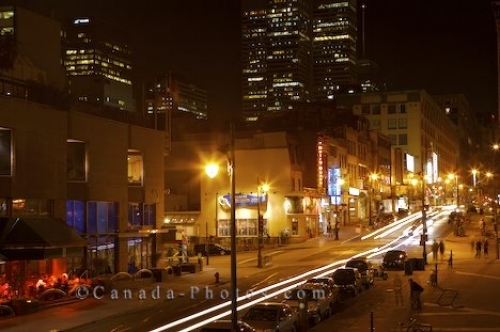 During the evening hours, the Complexe Desjardins along Rue Sainte-Catherine in the downtown core of Montreal, Quebec is illuminated in a soft yellow glow. The Complexe Desjardins is one of the major attractions in Montreal where the shopping is outstanding, restaurants are exquisite and people come and go from the special events which take place here. Complexe Desjardins along Rue Sainte-Catherine near Place des-Arts in downtown Montreal at night, Quebec, Canada. Picture of the Complexe Desjardins in downtown Montreal, Quebec where many people spend hours shopping, dining and working.